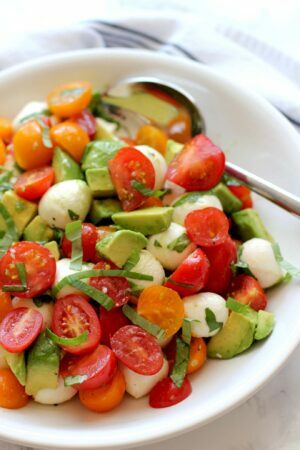 This tomato mozzarella avocado salad is an easy summer salad that uses just a few ingredients and comes together in minutes. It’s a fresh, colorful summer salad that everyone will enjoy. 2 cups of cherry tomatoes sliced in half. 8 oz fresh mozzarella – I used little mozzarella balls called bocconcini or ciliegine. Slice the cherry tomatoes in half and add to a large bowl. Dice the avocado into pieces roughly the same size as the cherry tomatoes and add to a bowl. Add mozzarella pieces to the bowl with the tomato and avocado. Roughly chop the basil leaves and add to the bowl. Whisk together ingredients for the dressing. Pour the dressing over cherry tomatoes, mozzarella and avocado in the bowl and toss gently until combined. Use a slightly firm avocado (not rock hard). If you use a very soft one the avocado will just blend into the whole salad. I used white balsamic vinegar in this recipe. Regular balsamic vinegar is okay to use but it will tint the salad a reddish/brown color since regular balsamic vinegar is much darker in color. If you make this recipe and enjoy it, please leave a comment and rating on my website!